Since so few people fly with bicycles, I am always concerned when returning home with my bike that the staff at the check-in counter might find some reason not to accept my bike and I'll have to leave it behind. I try to take a ride out to the airport a day or two before my flight to alert the check-in staff to my bike and find out what their requirements might be. I went out to Madagascar's airport three days before my departure. Unfortunately, it happened to be one of the two days each week that the airline I was flying, Turkish Air, did not fly into Madagascar. I wasn't concerned enough to try again, as I knew the Turkish Air website clearly spelled out its bike policy. Unfortunately, it wasn't so detailed as to specify that the Madagascar airport did not accept credit cards to pay the $128 bike fee--cash only. That would not have been a problem if the ATMs of Madagascar weren't so erratic dispensing cash. The two at the airport had rejected my various cards upon my arrival and they were no more obliging at my departure. That did not cause me an immediate panic, as I was certain Turkish Air would find some way to accommodate me. I have always been blessed with good fortune when it comes to my bike, so I looked upon this as another opportunity for goodwill. I was confident this would have a happy ending. I had saved the receipt for the bike fee from my flight to Madasgascar, which showed the credit card I had used to pay for it. I hoped it would be a simple matter of the staff at the airport calling or texting my credit card number to an office where they could process my card, not much different than my on-line purchase of my ticket. The woman in charge at the desk did not have the authority to do such a thing. She needed to check with her manager, who happened to be flying in on the flight from Istanbul that I would be departing on. It was a quick turn-around of less than an hour, but ample time for him to resolve this issue. He was returning from a training seminar. Evidently it did not include customer service, as he was unwilling to do this or to take any initiative to solve my crisis, or even to see me, simply dictating his commands to his underling. The $128 fee was for two flights, $64 to Istanbul and than $64 to Chicago. I had $70 cash. I asked if I could pay for the first flight and then the second in Istanbul. He was unwilling to do that either. Now I was beginning to feel a panic at his obstinance as the clock ticked away. I've had my heart plunge may a time over some seeming bike catastrophe and have always remained calm and had the issue resolved. I had remained calm for the two hours I had stood to the side of the check-in counter waiting for the manager to arrive or possibly for his assistant to suddenly come up with a solution to this problem. During my month in Madagascar I'd had numerous occasions where the Malagasy had been most considerate and helpful when I was in somewhat desperate circumstances. I had several instances during the cyclone. I was confident this personal cyclone would bring out that side of the Malagasy as well. But these people either did not recognize how important a bike could be or they were so fearful of departing from strict corporate policy, that they stubbornly refused to find a way to accept my bike without the full amount of cold cash in their paws. When it came down to less than thirty minutes to departure, I did start feeling panic. I was in a great dilemma of whether to delay my departure until the next day and get the funds for the bike or to leave it behind, reconciling myself that it was time to replace it. I didn't believe it possible that the gods would allow me to be parted from my beloved bike that had taken me all over the world the past thirteen years. It would be like losing a limb. I've had bikes stolen, but the agony of this was causing me much worse pain. I asked the woman I was dealing with how much it would cost if I delayed my flight. She couldn't immediately tell me. It would depend on my ticket. It might be unrefundable, which could well have been the case since I had bought it from CheapAir at a considerable discount. I had already been told that the Turkish Air ticket office in the city did not accept credit cards, so I might have to come up with fifteen hundred dollars or more in cash for a new ticket. That would be less than what it would cost to replace my bike, but a daunting task. The woman at the counter asked if there was someone who could bring me the 407,000 Ariary fee for the bike. I should have called Juerg, my Swiss Warmshowers host, long ago, but I didn't believe Turkish Air would be so obstinate and customer-unfriendly. Now it had come to that. The assistant manager allowed me to use her cell phone. Juerg said he would dash right over on his bike. He was ten miles away, not likely to make it in time, but I hoped the woman, who had heard our conversation, would trust that he would arrive with the money and release my bike. She had to check with her boss. He refused. These people were utterly heartless and uncompromising and unwilling to save my day. I began moaning and doubling over as if I were suffering cardiac failure, not sure if I were faking it or if it were real, hoping that might save the day, just as Bettina Selby resorted to tears at border crossings to get a visa. But my act didn't soften the resolve of my adversary. At least with Juerg coming to the airport, he could rescue my bike if it didn't make the flight and either hold on to it until I could return for it or find a reasonable way to send it. With luck Turkish Air would put it on the next day's flight as delayed luggage, such as when luggage misses a connecting flight, though they would not make any such promises. None were even willing to make an offer of holding on to it until I could return for it or get them the funds to send it. If not for Juerg the bike would have been lost to one of these scoundrels, as they may have secretly been wishing. I did not feel any sense of relief when I boarded the flight. I was still devastated by the trauma I had been subjected to and the heartlessness of these people. My travels generally bring out the good in people. I was leaving Madagascar with an extremely sour taste, not the way to end one's travels. When our flight departed twenty minutes late, I held out hope that it might have been to accommodate my bike, but no one came to my seat with a claim number for my bike or the good news that it was aboard. It was a long eleven hours to Istanbul, where I immediately went to a customer service desk. They had no indication of an extra bag attached to me. Next I sought wifi to see if there was word from Juerg. 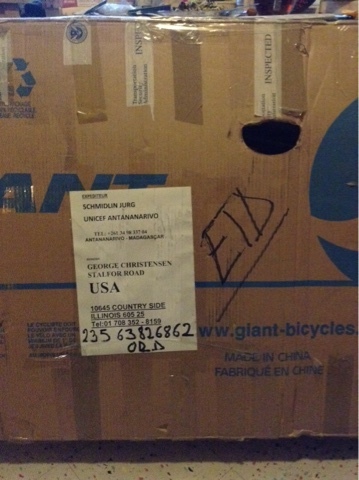 Yes, he had the bike and would try to send it Turkish Air cargo the next day. That was good news, even without knowing the cost. But without a bike, it meant I would have to take a taxi home from O'Hare rather than riding my bike, the final indignity. Janina couldn't pick me up as she would be teaching her Women in Art class. Juerg was able to get my bike on the Turkish Air flight a day later, partially thanks to his UNICEF connections, but at about three times the cost of what it would have cost as personal luggage. I will forever be indebted to his heroic efforts. And there was an additional $75 fee from the cargo company at O'Hare when I picked it up. I was the lone civilian among a long line of truckers picking up much larger loads. It was wonderful to be reunited with my bike, but I have yet to recover from the ordeal. As one friend commented, "The experience must have taken ten years off your life." I have waited three weeks to write of this nightmare, hoping there would be a happy appendum of Turkish Air refunding me the difference in cost of cargo and commercial, but surprise, surprise, they refused. Will I ever fly Turkish Air again? Probably, but I'll be certain to have $150 or more in reserve for my flight home. Man, that was gut wrenching. I had a similar experience on Amtrak, where they wanted to send my bike on the next train and one then the next day. I left it at the desk, but asked the conductor if I might bring it on board. When he said yes, I bolted out of the train (to his objection), ran up the down escalator, yanked the boxed bike from behind the counter (to their objection) sprinted to the train, jumped on and had the doors close behind me 2 seconds later. Glad you were reunited anyway. T.C. : Your heart must have really been pounding, especially if you'd left a bag of gear on the train that might have pulled out before you could get on it. If the train was starting to roll would you have dropped the bike box and raced to be reunited with all your gear or stayed with the bike? Matt : My spirit isn't crushed, but it sure was disheartening to be victimized by such an insensitive and uncaring manager. I'm accustomed to people respecting me as a cyclist and wanting to help me, such as Juerg did so heroically and unheaitantly, even putting out $350 on good faith. The woman assistant manager, who I had personal contact with, was sympathetic, but not enough to take any initiative to override strict policy. I think that was somewhat cultural. The manager who avoided me probably just didn't want to make a decision that he feared he couldn't justify or defend to his superiors. It sure would have been nice though if Turkish Air would have acknowledged that I shouldn't have been so severely penalized by their inability to process a credit card and given my all the extra money they made off my bike going cargo.